A high quality adhesive with very high initial tack – therefore called High Tack. It’s a quick-acting adhesive which holds the weight of the material immediately. 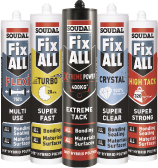 Fix ALL High Tack is a KOMO-certified construction adhesive based on BRL3107. Also available in a crystal clear product called Fix All High Tack Invisible.